comes great responsibilities. We need to remember what matters the most - seeing those children grow to be adults who know, love and follow God. This is what really matters. Of course, along with the responsibility to hand down faith, comes generous amounts of joy as well! My then five-year old grandson and I were talking this past Summer about how much God loves us. He smiled and said; "Grandma, I have loved God ever since I heard about Him!" Oh yes! Great joy! 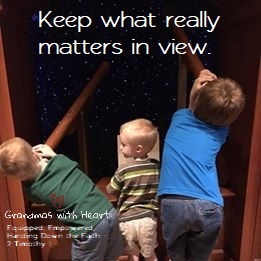 Yes, it matters for us to keep what really matters in view!